Elifar has funded a Race Runner for Elsa Maria who is 10 years old and, like her twin sister, has cerebral palsy. The Race Runner is a mobility aid which looks like a bicycle but is propelled by the athlete’s feet on the ground. Elsa Maria is a wheelchair user and cannot stand or walk unaided but attends mainstream school with 1:1 support. She spends a lot of time in her powerchair but also enjoys being in an upright position with her feet on the ground as it helps to bring her closer to her friends and helps her to take part in activities. 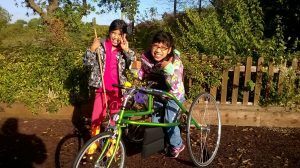 Elifar funded this £2,400 Race Runner to give Elsa Maria something fun to do in her physiotherapy sessions and provide greater opportunities to strengthen her legs and to take part in outings with her family. She also plans to take part in Race Runner events within the Cerebral Palsy Sport’s athletics programme.